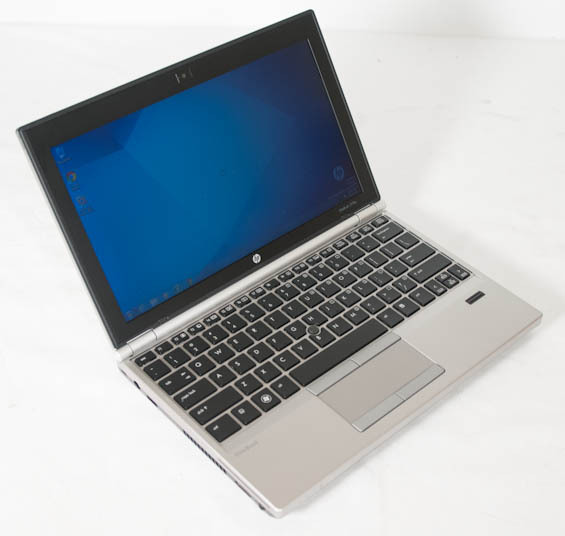 HP EliteBook 2170p Ultraportable Review: Business Class, But Business Savvy? We recently reviewed Acer's Aspire V5-171, a notebook that proves that there's a life (and a market) after netbooks but before ultrabooks. The essential gap that's materialized has been between the fast decaying netbook market (its death spurred on by Intel's Atom coupled with the high price of Brazos), and the expensive ultrabook market. More than that, though the 11.6" form factor is basically as small as a notebook can get while still featuring a full-sized keyboard, it's a gap that's essentially been going underserved for roughly a year now. Acer wasn't the only one to spy this gap and try to fill it. ASUS has a notebook in stores right now that sports either an Ivy Bridge i3 or a Sandy Bridge i3 and touchscreen for Windows 8, and HP has an offering in their enterprise line that we have on hand for review today: the EliteBook 2170p. These notebooks have all been released with very little fanfare, and that's a shame, because there's definitely a niche for them. But while the Acer offering turned out to be a remarkably good deal for cost-conscious consumers, did HP misstep with their unusually pricey EliteBook 2170p? It's tough to really get out of the gate without mentioning what HP is charging for the EliteBook 2170p. Enterprise-class notebooks almost always have a premium attached to them (though HP serves budget businesses with ProBooks and Dell with Vostros), the cheapest the 2170p goes for is $999, and that's for an Ivy Bridge i3. This is business class, but the price tag is still squarely in ultrabook territory. It's entirely possible for HP to make up the gap with a top shelf design, so let's see what we have to work with. Dimensions 11.5" x 7.56" x 1.04"
The price tag for our review unit is brutal, but if you're willing to drop down to a Core i5-3317U (and there's very little reason not to), you can shave about a grand off. HP also at least presently is offering a coupon code that chops a respectable 25% off of the purchase price, and from there you can get the EliteBook 2170p in the neighborhood of $700-$800, which is much more reasonable for a business class machine. As with the Acer Aspire V5 I reviewed recently, the ULV Intel Core i7 simply isn't worth it (the dual-core i7s in general frankly haven't been in some time anyhow). It's not unusual to see a mechanical hard disk standard in an enterprise-class notebook where known reliable technologies are more important, though the lack of any kind of SSD caching does hurt, and the chassis does have at least the real estate for an mSATA SSD (though no port to house it). Finally, connectivity is pretty stellar, with even SmartCard port on hand for business users, but the battery is a major sore spot. HP offers only a 4-cell, 30Wh battery or 6-cell, 48Wh battery as options. The 4-cell sits flush with the body; unfortunately we didn't have a 6-cell on hand to test with. "I would never spend $1k on a laptop with a 1366x768 display." A resolution of 1366x768 is fine on a 11.6 inch display. Nope. 768px tall makes it like view webpages through a tank-slit.. 16:9 is a terrible aspect ratio made worse by low resolution. The 900px tall 16:9 screens are about the lowest that are really useful.